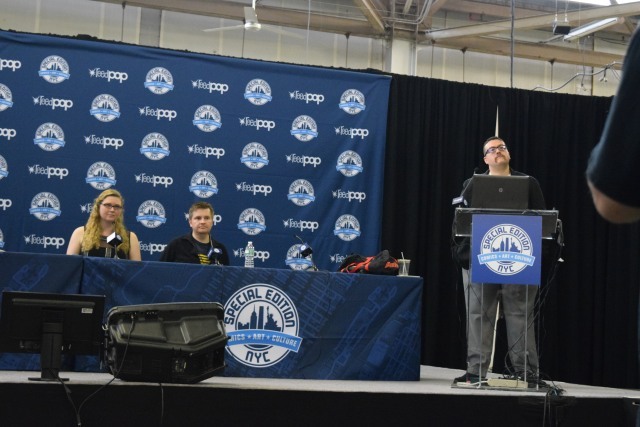 This year, ReedPOP moved the Special Edition convention from the north hall of the Jacob Javits Convention Center to Pier 94. This new venue felt slightly larger than the space in the Javits, but the Javits used rooms away from the hall for panels, while Pier 94 had them as part of the space behind curtains. Walking in to Pier 94 had the vendors up front, with some off to the side and others ahead on the way to the large artists alley. Off to the right were two large curtained areas that were used for panels, but they were less than effective for containing the panels. Straight back was a large assortment of writers and artists who were drawing, promoting, and talking about comic books that they worked on. A few artists and writers had significant lines – the largest ones belonging to Scott Snyder of Batman fame and Jason Latour and Robbi Rodriguez, creators of Spider-Gwen – but most were easily approachable and affable about talking about their work. The biggest problem with the convention was the panel area. I attended a single panel this year, the invite only Marvel Unlimited panel, but they were forced to scale it back because any “secret” things they wanted to share with us they could not because of the open nature of the area due to the open area. The microphones carried outside the “room” and often was disrupted by the panel going on in the other “panel room.” It was distracting and unfortunate that the fine folks at Marvel Comics could not share everything they wanted to with us. It was nice to return to the days of comic book conventions that were about comic books. A modicum of cosplay was present, which was not the focus but did not deter cosplayers from dressing up, and other fandoms were discussed and represented here and there, but it was about the creators and their work and something I appreciated being able to appreciate without the distractions of video games, movies, and other media.